The under $300 price range (over $200) is where you’ll find the sweet spot for quality air compressors with good performance and portability. For larger jobs such as building a shed, doing bodywork on a car, or anything which requires more constant airflow instead of driving the occasional nail or brad, you’ll probably want something a bit more. 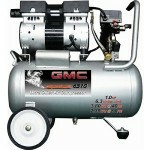 Some of the best bang for the buck air compressors are found in this price range. 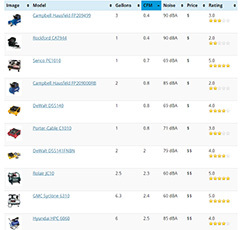 Below are what we consider to be the top products. 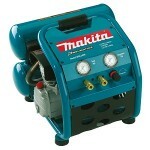 The Makita MAC2400 is among the best selling air compressor for consumers and contractors alike. It is priced around the $300 mark and occasionally dips under that. The MAC2400 is all business. Powerful. Durable. Reliable. There’s a reason why Makita products have such a high resale value. It will handle pretty much any job you throw at it including running multiple tools on it at the same time. Sure it’s heavier than most portable compressors but that tells you that it’s built to last. If you ever do end up needing repairs, Makita customer service is top notch and parts are easy to find. The JC10 is interesting. Comparing the specs to the Makita, you would think it’s a bit underpowered. Well the truth is, 2.3 CFM at 90 PSI is more than enough for most homeowners and even some contractors. 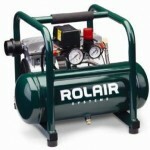 Rolair is known for manufacturing high-quality and efficient compressors. The JC10 is also exceptionally quiet at only 60 dBA. It is one of the best when working inside the house on trim and finish work, cabinets, and such. We haven’t heard of a single individual who’s purchased the JC10 and not loved it. Made in the USA. At its current price, it’s a steal. While not the most aesthetically pleasing compressor, the GMC (not built by GM) Syclone is also incredibly quiet (60 dBA) as the Rolair above but has a much larger 6.3 gallon tank. The larger tank means the compressor motor won’t need to cycle on and off very often and it doesn’t have to do much catching up as with smaller tanks. It doesn’t have quite the same build quality as the other two but it’s not something to be too concerned about. With the lowest price out of the three, the 6310 is a fantastic value and would be a great unit for your garage.